Marmite is on fire at the moment, with two of best campaigns already this year coming from them. With their recent “Hard Breakfast, Soft Breakfast, No Breakfast” advert, the brand played off the back of Brexit and combined it with their famous ‘love it or hate it’ slogan. It was an incredibly clever piece of advertising and achieved what many other brands, such as HSBC, failed to do when attempting to ride the Brexit social onslaught. 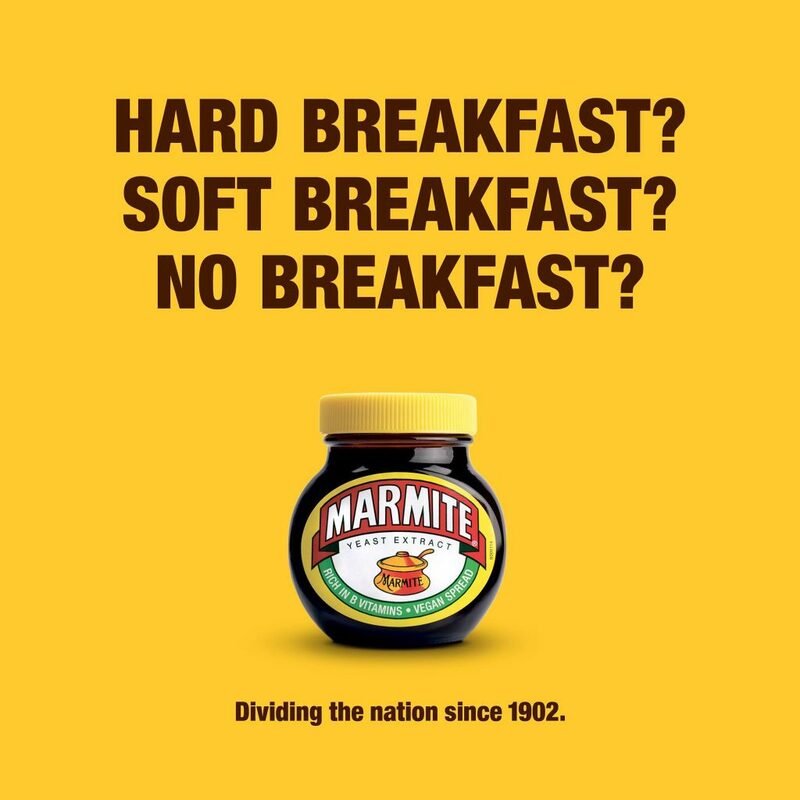 Harnessing the controversial nature of current Brexit climate, Marmite added a light-hearted voice while affirming its place in the British public’s heart. They then continued their run with their marmite/peanut butter launch. Many thought this was an early April Fool’s Day prank, but love it or hate it this is a real thing and it’s launch was amazing. Combining two well-loved spreads the product launch divided Twitter, causing an avalanche of opinions declaring it a heresy or a heavenly gift. 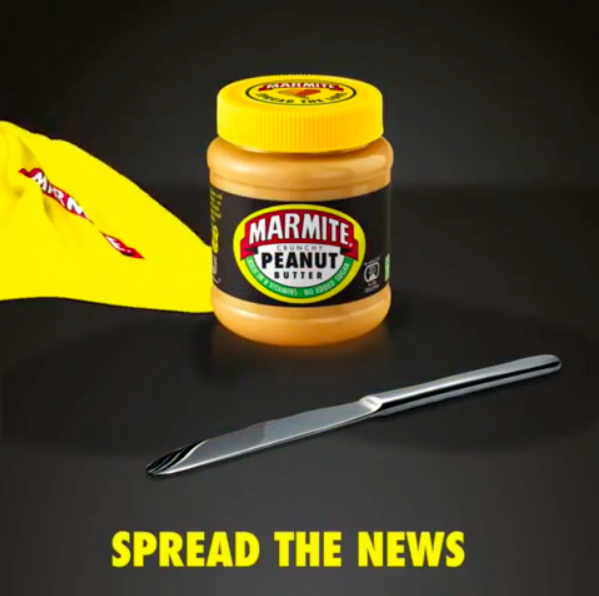 This controversy put Marmite at the focal point of March’s social media cycle, but behind the front of outrage marketing lays a savvy product launch move. This move is driven by consumer demand and market growth. The customer is always right, and in this case life does imitate social media, with Marmite’s Brand Manager, Camilla Williamson, claiming the idea for the spread comes after ‘a huge number’ of Marmite lovers shared recipes on social media that mixed the yeast extract with peanut butter. The Evening Standard said the spread combo “looks like peanut butter, it has a more molten consistency. When eaten, the initial taste is peanut butter before the strong aftertaste of Marmite hits you.” Something that will see the new spread flying off the shelves for people to taste themselves for sure. Marmite is already popular with in the Vegan community for its B vitamins, and nut butter is having a massive market surge, making the move a smart investment given the rise in health-conscious eating and veganism in recent years. In addition, it seems that it is unlikely to cost them core sales as Marmite’s parent company Unilever claims 60% of consumers would buy Marmite Peanut Butter in addition to original Marmite. They claim they will use tactile PR and social media to promote the new product, meaning this is definitely a campaign to watch. 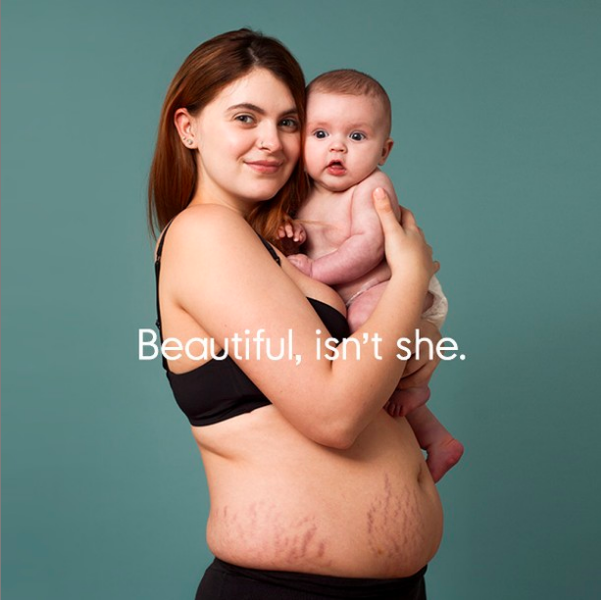 Praised by women across not just the UK but internationally too, Mothercare’s ‘Body Proud Mums’ Campaign celebrates the beauty of the post-birth body and represents a part of motherhood that is rarely portrayed in the media. The campaign also commissioned research into social media’s effect on mothers after birth, which led to the knowledge that over 80% of U.K. mothers have admitted comparing their post-baby bodies to unrealistic ideals. This is perhaps not surprising given that 90% of women in the 18-25 age group expect their bodies to compete with celebrities and what they see on social media. More than half of mothers on social media are found to use apps/filters on photos of themselves to hide things about their appearance that they don’t like. Perhaps our favourite campaign from the start of the year comes from a brand that was created accidentally in reaction to Brexit. While it reached huge and meteoric popularity on social media following its launch on Twitter on 9th January, the first time it came to the general public’s attention was probably at the People’s Vote March. 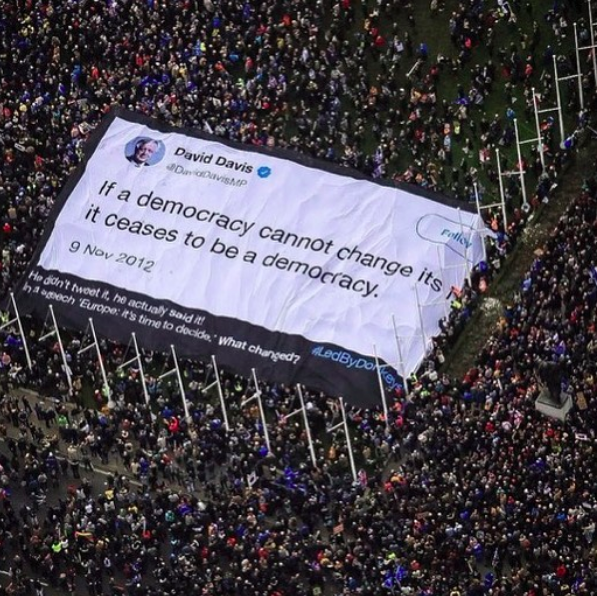 This was when they unfurled a banner printed with a tweet from David Davis saying: “If a democracy cannot change its mind, it ceases to be a democracy” in Parliament Square. Aerial photos of it were shared millions of times around the world. 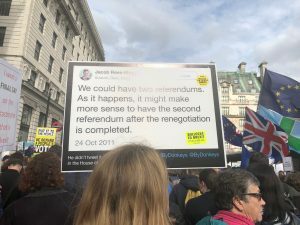 At the 2-million strong People’s Vote March there were also a huge amount of Led By Donkeys banners and t-shirts on display. In addition, there was also a video of their two digital ads vans displaying a choice of Farage’s older tweets and declarations with Farage’s real time reaction on the earlier (and hardly attended at all), Leaver’s March. This has gone viral with over two million views. Basically down the pub, where a group of Dads came up with the idea over some beers down their local. Unlike most pub musings on politics this one stuck, and on January 9th they put up their first poster on a billboard. It was a tweet by David Cameron that said: “Britain faces a simple and inescapable choice — stability and strong government with me or chaos with Ed Miliband”. They then took a photo and posted in to their newly-created Twitter account and within 24 hours they had 3,000 followers (including our MD Claire Burdett – she’s savvy like that) and requests flooding in for tweets to put up next. The banners with the accompanying photos and tweets then became a regular fixture on social media. Their followers rocketed (£164k as of 4th April, and steadily rising) as a frustrated British public found in the Led By Donkeys’ social media and off-line banners a way of expressing their anti-Brexit objections, something they have not been allowed to do by the government or indeed on any of the main media channels or in the majority of newspapers. Once Led by Donkeys set their mind on a stunt for the big People’s Vote March they allocated funds sourced from Crowdfunder. Initially asking for £10k, they hit this within two hours, raising to £67K total, making them the biggest crowdfunded political campaign in UK history. Their latest is a 3,000sqm projection on the White Cliffs of Dover. This is one campaign that is creatively making a difference by using online and offline. It’s works because bringing an online activity into the offline world seems to overcome the internet’s ephemerality; it makes a statement more substantial. This is something that Spotify have also used to great effect with their annual Spotify Wrapped campaign, as covered by us in our round up of the best social media campaigns of 2018. All three of these campaigns have tapped into the current social mood and climate, converting ideas floating around the internet into tangible social media sensations that drive results. If this is setting the tone for the rest of the year I think we’re in for a truly memorable 2019. 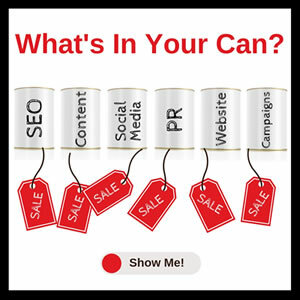 Love these campaigns but not sure how a similar style would fit into your brand? 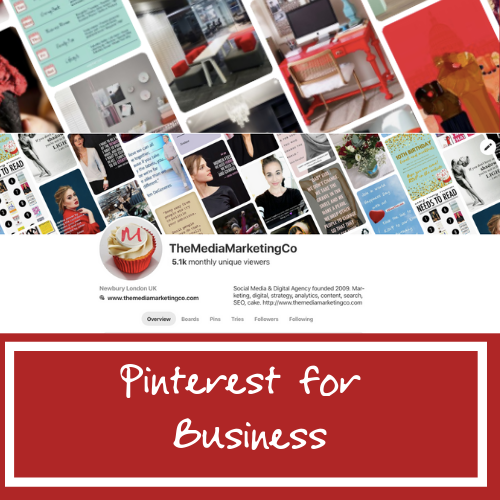 We can help you capture the same ethos, simply check out our Social Media Packages.